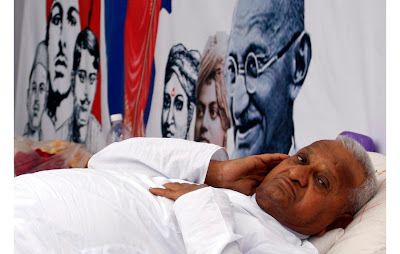 Anna Hazare taken into custody before he could begin fast. I condemn! Only an utterly coward, utterly spineless govt would behave like this. 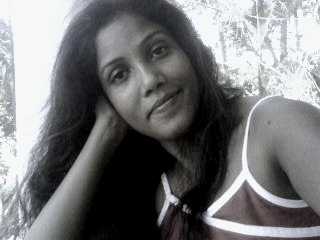 I was hearing the Tricky Tridev (Kapil Sibal, P Chidambaram and Ambika Soni) addressing the media, defending Anna's arrest. The fake smiles n the obsolete logic (law n order issues) apart, what I really found pathetic is that they were tutoring and scoffing at the media like it was a bunch of ignorant ppl. Bullying has got in the vein of these ministers!!! To all friends staying in Hyderabad: India Against Corruption forum will hold candlelight vigil tomorrow at Necklace road at 6 pm. Also, day long protest (9am -6 pm) is on at Indira Park. Do join, if you can. Good morning. Y'day we saw and participated in a unique, never before awakening of the common citizens who no longer feel shy to ask for their rights without being member of a political party/NGO. Today will be equally exciting. And today, when you hear any Doubting Thomas pulling Anna down, do remember, Mahatma Gandhi was also ridiculed and called an 'idealistic fool'. Some Indian NGOs seem addicted to media bashing! First they hated it for ignoring people's issues, now doing it for focusing on it. So, finally, there is a 3rd Lokpal Bill(anti-corruption bill). And its going before the standing committee. Fine. But I really wonder why it took so long to come out. Both Aruna Roy and Nikhil Dey (Indian social activists) are extremely resourceful people with huge list of contacts. So, how come we never heard a word about their version of the bill until a day ago? Now, echo of anti-corruption movement in Germany!!! Tomorrow 21st August, 11:00hrs - 13:00 Hrs at the premises of Hindu Temple, Billstrasse 77, Hamburg ( Germany). Best of luck! Its the 8th day Anna's fast. Anger is welling up in me. Last 3 days I hv heard some bizarre logic from some ppl hellbent on dismissing this anti-corruption struggle. Mixing issues, comparing to Sharmila, why Anna not doing this, that, and every goddamn issue under the sun etc. Often I see only veiled jealousy in those words, otherwise the joy of lecturing (bayanbazi). Wish ppl had left the lecturing to politicians, and support the struggle, because its aimed at making India better for all. OMG! Just heard Salman Khurshid (Indian Law Minister) telling media "I went to meet Arvind Kejriwal (an Anna Hazare aide) just to find out what are they doing, why are they doing it. You people don't tell anything". hahahaha, Salman Khursheed, were you hibernating all these days? Since Anna Hazare started his fast, my mom has been watching Star News at 9 pm, instead of her favourite "Pavitra Rishta" (sitcom) on Zee. Won't be surprised if Ekta Kapoor sends a team in Ramlila Maidan to collect footage for next episode :) On Sony, 'Krishnaben Khakhrawala" has already started an anti-corruption crusade. Talk of the cascading Anna effect! Whichever religion you follow, wherever you worship, this evening say a prayer for Anna Hazare! Lavish Iftaar party is on at PM Singh's house tonight. All ministers and MPs (including those who just rejected Janlokpal Bill) are busy filling their plates with gourmet food, while 74-year old Anna Hazare is spending his 9th night of fast. Disgusting! How many of these people know about the true message or have the spirit of Ramadan? One moment I am HOPEFUL (that govt will listen to the voice of the people), next moment ANXIOUS (Anna's health), next moment full of PRIDE (Anna's leadership and the country's awakening) and then again I am WORRIED(what if the govt does another U-turn and betray people?). Juggling with so many emotions simultaneously. This movement has been quite a process of self-discovery!!! Rahul Gandhi, "his own parrot" finally speaks on corruption. Speech full of rhetorics! It seems there are a lot of Manish Tiwari fans on FB who have suddenly become active. Using abusive language against Anna Hazare, throwing wild, damning allegations against every member of team Anna etc. Try asking what is the basis of such accusations and all you get is a foul reply. How to deal with this kind of Taliban? 1 step ahead, 2 steps back; march forward, about turn; make a promise, break a promise - can anyone tell me how the hell am I supposed to respect this goddamn govt after such bloody back n forth walks? When was the last time you watched Lok Sabha TV and listened to the lectures of MPs on a Saturday evening? (Let me be honest, I never did it). The impact of Anna has been bigger than you realized :) :), hai na? What a glorious morning!!! Anna Hazare, Indian democracy and we, the people of India sharing a victory. Congrats to all my friends for being a part of such a historic moment!! God bless India!